Press (optional) tofu bricks for 15 minutes. Cube tofu into bit sized pieces. Toast pine nuts for 4 minutes in skillet on low heat. Transfer to prep bowl and let cool. Combine in food processor broccoli, basil, oil, lemon juice, yeast, garlic, salt, and flakes. Blend all to a smooth paste. Add pine nuts, and 2-3 tablespoons of water and blend to a smooth sauce. In skillet, over medium heat, cook tofu until golden brown. Cook pasta in sauce pan following package instructions. Add desired amount of dressing to pasta and toss. Add pesto to tofu in skillet and mix. 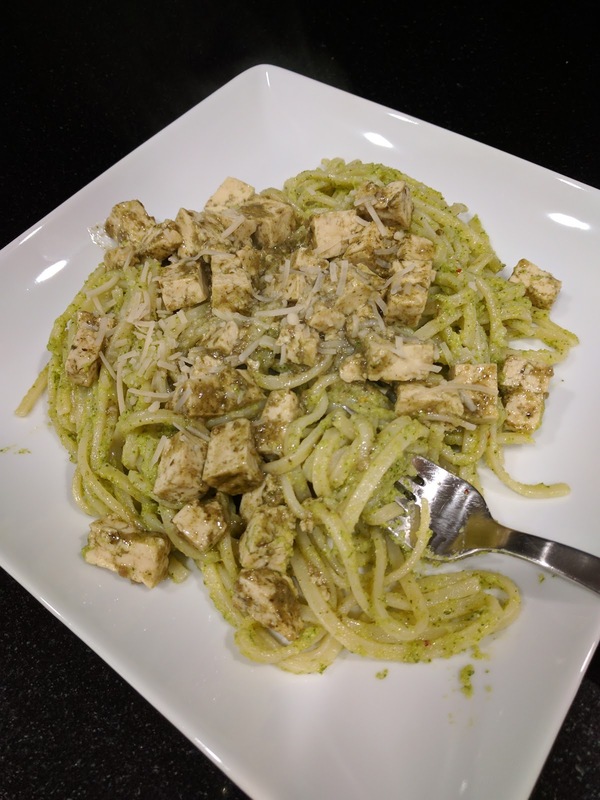 Top each plate with tofu/pesto mix.